Based on a series of sci-fi novels, this series tells the story of a massive conflict between the Prussia-like Galactic Empire and the Free Planets Alliance. It describes all levels of the war, from the tactical to the strategic, but focuses most on the two opposing militaries' leaders: Reinhard Von Lohengramm and Yang Wen-Li. At the time of watching "Legend of the Galactic Heroes: Overture to a New War", I had already gone through the first couple of seasons of the "Legend of the Galactic Heroes" main series. "Overture to a New War" tells the events leading up to the Battle of Astate shown at the beginning of the series, as well as the battle itself. I didn't watch it prior to the series because I like to watch things in release order rather than chronological order. It had taken me quite while to get into the series (roughly the whole first season in fact), and I'd always wondered whether this was due to my lofty expectations of it getting in the way of my enjoyment, or whether the first season just wasn't very good. In "Overture to a New War", I've found my answer. I had NO problems getting into this movie - it's everything that the start of the main series should have been. While movies that re-tell parts of series usually condenses the story and ups the tempo to make it more suitable for the format, "Overture to a New War" does exactly the opposite - it expands upon the beginning of the series and takes its sweet time in building up to the Battle of Astate which the series dived straight into. And what a difference this build up makes - by introducing the characters more gradually and spending time fleshing them out, the show becomes far more engrossing, and gives viewers a reason to care about the characters who were given what felt like random cameos in the series. In essence, it's a different approach to the story telling. The main series started off much more plot driven, and felt hurried and unseemly in its haste to introduce the 9872 characters in its cast and get the plot going - much of the first season felt like one massive set up for later events. In contrast, "Overture to a New War" is more character driven, and is far better for it. The first part of the movie, concerning the build up to the Battle of Astate, is new material, and it's particularly good. In fact, it's actually better than the second half that concerns the battle itself. Though the second half is also much improved as a remake, it's dragged down by mostly the same things that dragged down the Battle of Astate in the main series - some parts of the battle are just to stupid to be believable, especially with some of the inexplicable school boy errors that the commanders on the alliance side makes. Though most of these stupid points still exist in "Overture to a New War", it at least spent some time showing the thought processes behind the strategies, even though the idea of spreading your fleets so wide that they can't even support each other (the empire's fleet even managed to find time to take a long nap in between engaging two alliance fleets) still seems to me like an extraordinarily stupid mistake to make for military high commanders. Another benefit of this build up is that the tragedies during the battle are now meaningful. In particular, there is one specific death scene that is given a much greater weight thanks to the build up. Of course, it also helps that they sensibly changed the manner of his death - in the series, he got impaled by a massive lump of rock-like thing, which looked so ridiculous it reduced the death scene to a joke. I'd like to talk a bit about the characters now, as this is arguably the biggest improvement that "Overture to a New War" brings to the table. The series took a long time to bring to life the cardboard characters it started with - and in fact many of the characters never make this transition - but in "Overture to a New War", they feel alive to begin with. In addition to simply polishing existing dialogues and characterisation, they also added minute details here and there which made the character feel much more real. One example of this is the scene where Yang clenches his fists and crushes a paper cup as he worries about his comrade - a simple gesture that sets him far apart from the overly desensitised Yang shown in the first OVA "My Conquest is the Sea of Stars". Another example - and this is probably my favourite scenes this movie - is when Reinhard does a handstand in his sisters lawn. This simple action spoke volumes of his change of mood when visiting his sister. Also, for the first time, it occurred to me how young he was - a youth of about 18 or 19, it's the only time I've seen this normally cold and impassive character display the silly, playful tendencies of his age. This creates one hell of a contrast to the person he becomes later on, a contrast that's not so obvious in the series. Watching a rare moment where Reinhard and Siegfried lets themselves go, I couldn't help but feel that the two of them could have achieved anything together - the chemistry there was just so strong. These examples just goes to show that a few extra, subtle touches can make a world of difference. The villains too, have benefited from the improved characterisation. In the main series, most of them are obvious jackasses, often acting like kids throwing tantrums. In this movie, their behaviours are given more restraint, and because of this they come across more convincingly as schemers rather than clowns. "Overture to a New War" has also improved vastly in the sound department. The deployment of classical music comes across as much more thoughtful compared to the haphazard, lazy approach taken in the first OVA and earlier part of the main series. If I have one complaint to make - and it's a minor one - it would be the use of Beethoven's "Moonlight Sonata" for a death scene. It's a ridiculously popular, sentimental piece, and using it there comes off as a little too unimaginative and- dare I say, cliched? "Overture to a New War" shows a maturity in its execution not just through its use of sound, but also through its use of LACK of sound. One of the most memorable scenes in the movie is the bitterweet one at Lap's celebratory drinks after his successful proposal to Jessica. In this scene, they muted the dialogue, and the narration is gently guided by the imagery and the background music. This left much to the imagination, and it achieves its purpose probably better than any dialogue could have. If "Legend of the Galactic Heroes" had been directed in a similar fashion to "Overture to a New War", I probably would have embraced it with open arms from the start. By paying attention to HOW it tells the story instead of just the story itself, by fleshing out the character instead of just introducing them, "Overture to a New War" succeeds where the main series falls flat for long periods. It's engaging, subtle, and possesses an effortless grace that the show had always yearned for. It's just BETTER. LOGH has been rated really high on this site for a long time. When I first came to MAL I was interested in watching more great anime, so LOGH being so highly rated was one of the first animes added to my plan to watch list. I never really got to it though because I wasn't sure how good it was going to be since it was pretty old and long 110 episodes. Now that I finally watched it, I can say that LOGH is truly deserving of that high rating and mabey even more. Even though I watched the series first (which is why I was confused for the first few episodes), I reccommend watching in this order. I believe this order will enhance the viewers enjoyment and experience. LOGH Gaiden 1 and 2. Okay now on to My Review Finally. LOGH Overture to a New War is a movie that is a better detailed version of the first 2 episodes of the main series. The Plot Is about two military Leaders (Reinhard Von Lohengram and Yang Wen-li) from Different sides, overcomming obstacles within their own side while at the same time battling each other in strategic space warfare. The movie also has more background information leading into the main series. I gave a 10 to the art and animation of the movie because first of all it is better than the series animation. It looks more new and clean than the main series. The characters and spaceships are well drawn and so are cities and places. Sound I give a 10 the movie sounds really good and has great classical music that goes well with the movie. They time the music really well with what is happening at the time. They also have great voice actors in the movie and series. Characters are amazing in the movie and the series. You will see yourself likeing charcters from both sides and not know who you are rooting for to come out alive or win. The charcters get well developed in this movie but you can tell there is still room for more developing after the movie which makes the movie so great. I enjoyed the movie alot its one of those movies you can watch over and over. Its a real good introduction to the series and some of the main characters. Overall Its a epic movie and I believe if you give it a try you will enjoy it, especially space opera fans. After the disappointment that was the previous Legend of the Galactic Heroes movie called Golden Wings, another movie came out. This movie came out a year before the show started its third season. What did the creative staff make that time? A movie known as Overture to a New War. I don’t think giving you a sypnosis of this movie will be needed this time because this movie is an extended retelling of the first two episodes of Legend of the Galactic Heroes. To be technical, this is a production by Kitty Films and Magic Bus. I can tell you that this movie has some of the best animation to offer on Legend of the Galactic Heroes. Yes, I know this is because of the fact that this is a movie, meaning a higher budget and so forth. This movie also follows the same character designs from the Main series and not that atrocity known as Golden Wings. The character designs look fantastic as always. The animation is also very damn good in this movie. The music (like the Main series) is a mix of classical pieces and they are used terrifically in this movie. Is there more to say about the soundtrack to this series?. When it comes to voice acting, The original cast members reprise their roles. Ryo Horikawa is terrific as Reinhard von Lohengramm. The late Kei Tomiyama is also terrific as always with his role as Yang Wen-li. Masashi Hironaka is another terrific seiyu as Siegfried Kircheis. Hideyuki Tanaka is great as Jean Robert Lap. Katsuji Mori is great as Mittermeyer. Kazuhiko Inoue is also great as Attenborough. Keiko Han is terrific as Annerose. Mami Koyama is great as Jessica Edwards. Unsho Ishizuka is great as Job Truniht, and Norio Wakamoto is fantastic as always with Reuenthal. The voice acting is solid in this movie which the show as a whole has solid voice acting. If you are looking for an English Dub to this show, you are out of luck. No English Dub exists for this movie, the main series or any other entry in this franchise. As far as characters go in this movie, this movie does the first two episodes justice by adding more than what was shown in the first two episodes. I did feel that more could have been added at the first two episodes and this movie does just that. We get some background on Yang Wen-li and Reinhard von Lohengramm in this movie compared to the first two episodes which is great. This movie feels more like an extended cut on the first two episodes which I think this movie makes it obvious. There are moments that put weight on the characters and the story and some moments are different on the first two episodes and this movie makes those moments better. As far as the story is concerned, know that this movie is an extended take on the first two episodes of Legend of the Galactic Heroes. That’s it! There are some scenes that were not in the first two episodes and these new scenes really give more detail to this particular part of the story as well as more detail on the characters early on. My only nitpick is how the movie ends, they could have thrown in a little more to end it on a spectacular note. If you already saw the first two episodes, you really should watch this movie. If you do re-watch this anime. Start off again with My Conquest is the Sea of Stars, then jump into Overture To A New War. In a way, you got your first two episodes right there, then you can watch the rest of the show afterwards since this movie is an extended take on the first two episodes, Hence my analogy with the two movies. Golden Wings may have been a disappointment, but this movie sure as hell makes up for this. Legend of the Galactic Heroes: Overture To A New War is unlicensed, your only way to experience it is online. Look it up at your own leisure. With all that said, Legend of the Galactic Heroes: Overture To A New War is a nice addition even though it’s an extended re-telling. It does give more detail on the beginnings of a few characters which the first two episodes lacked a little. Fans of the show may appreciate this extended re-telling. If there wasn’t much that the first two episodes offered that haven’t convinced you enough, this re-telling is the definitive take on the first two episodes. 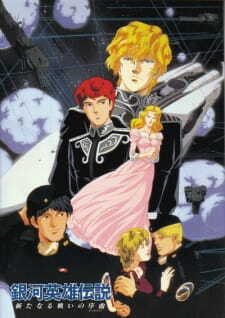 I give Legend of the Galactic Heroes: Overture To A New War a 9.5 out of 10, it is EXCELLENT! Feel free to leave a comment, and be at peace. Can you identify the song towards the end?